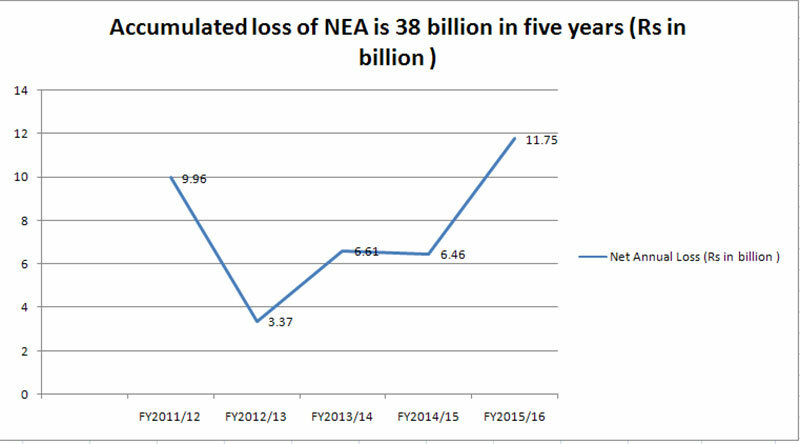 KATHMANDU, Aug 4: Annual loss of Nepal Electricity Authority (NEA) nearly doubled to Rs 11.57 billion in 2015/2016. It had suffered loss of Rs 6.46 billion in 2014/15. NEA plans to make public its data during its anniversary celebration on August 17, according to officials of NEA. The power utility imported additional 380 million units of electricity from India in the past fiscal year after power generation from its 17 plants and privately owned plants fell by 190 million units and 100 million units, respectively, data shows. 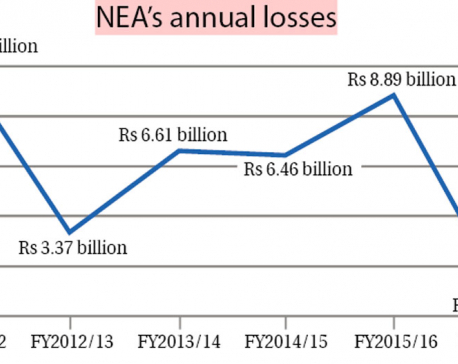 With this loss, NEA's accumulated loss has reached Rs 38 billion, surpassing the accumulated loss of Rs 27 billion in 2011 which was written off by the government in the same year. NEA has reported the highest annual loss among public enterprises. Officials say energy import from India is the major reason behind soaring annual loss. NEA suffered loss of Rs 3 per unit while distributing energy imported from India. Loss due to price difference is around Rs 5 billion. NEA mobilized total revenue of Rs 32 billion in 2015/16. It paid a combined amount of Rs 24 billion to independent power producers and Indian electricity suppliers. According to NEA, low rainfall resulted to lower water collection at Kulekhani Reservoir leading to decline in energy production by Kulekhani I and Kulekhani II plants by 27.3 million units in the past year. Likewise, Kaligandaki 'A' - the largest hydropower project in the country with installed capacity of 144 MW - generated only 760 million units in 2015/16 compared to 929 million units a year earlier. Shree Ram Pandey, station manager of the project, said power generation fell this year as special maintenance work is going on. “Maintenance work, which started on May 23, is continuing every today. Water discharge during dry season was also low. It also affected power generation,” added Pandey. Likewise, power plants, including Upper Bhotekoshi Hydropower Plant, in Sunkoshi basin were affected by the earthquake. 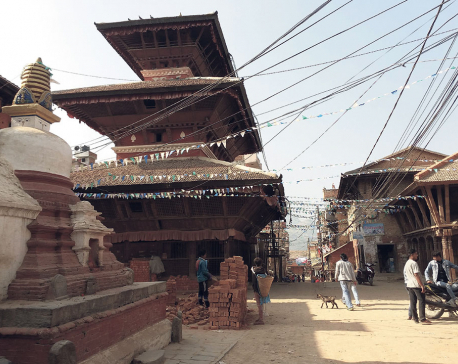 Upper Bhotekoshi suffered massive damage by a flashflood in Bhotekoshi River last month. It may take some more months for the project to start generation. NEA's technical loss also increased by 1.34 percentage point, or 5.4 percent, to 25.78 percent of total grid supply. It means one-fourth of the energy, which is worth around Rs 6 billion, is lost from the system. NEA had pledged to reduce technical loss by at least by one percentage point annually in 2011. But such loss is increasing with each passing year. Statistics shows NEA's expenditure in distribution has increased by 17 percent or Rs 920 million in monetary terms. Officials attribute such a significant rise to maintenance of overloaded transformers that caught fire by the use of induction stoves and other electrical appliances at the height of energy crisis due to Indian blockade last year. They say they were yet to figure out other possible reasons behind significant rise in loss. With the recent 18 percent increment in electricity tariff, NEA expects its income to increase in the current fiscal year. However, the plan to import more electricity to reduce load-shedding substantially will prove costlier for NEA. The electricity utility plans to import a total of 580 MW from India in the current fiscal year. 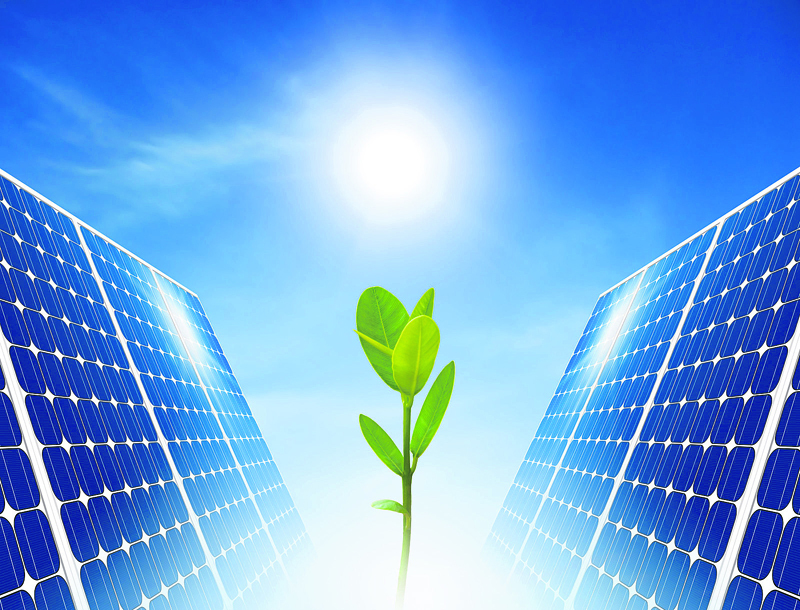 It is importing around 320 MW from India at present.